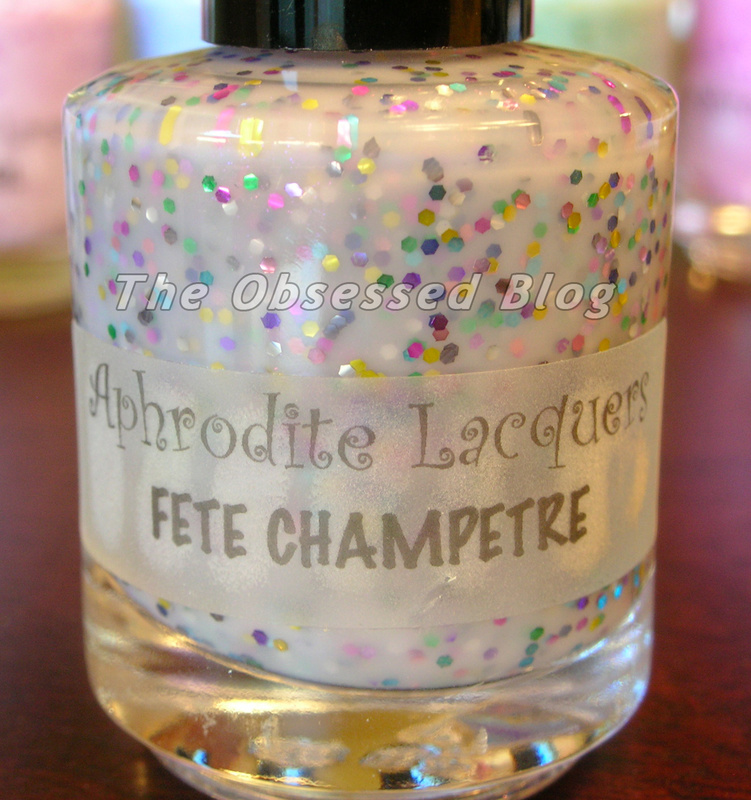 Today I want to introduce you to the newest collection from the amazing Aphrodite Lacquers – Printemps à Paris!!!! I can’t even tell you how MUCH I adore this collection. There are seven polishes in total, all with a white or pastel-tint base. White base!!! I love, love, love white bases!!! Without further ado, here is the stunning collection!! I adore that Rebecca named this collection in French. How very romantic and appropriate for these gorgeous pastels!! What I really love about Printemps is that most of them have a slightly monochrome look, with most of the glitter being a shade of its base colour. The exception are two very special polishes in this collection: Nuages (or clouds), which is a milky base with aqua, silver and grey glitter, and the extra-special “party-in-a-bottle” that is Fete Champetre (Garden Party), a lavender base with multi-colour glitters spanning the spectrum of all the glitters in this collection!!!! LOVE! And how appropriately named! This entire collection will be released on October 1st on Aphrodite Lacquers’ Etsy shop!!!! Right now, you can WIN this entire collection over on my Facebook page, even before they are released to the public!!!!! The contest started today and runs until midnight on Sept. 29th and is open internationally! First prize is all 7 BOTTLES of gorgeous Printemps à Paris!! A bottle of Fete Champetre!!!!! Isn’t this so pretty? I’ll have more swatches coming soon, but in the meantime, follow Rebecca on Aphrodite Lacquers’ Facebook page for the latest news, and head on over to The Obsessed on Facebook to win!! !